Ian Morgan Cron's memoirs is another one of my favorite reads of 2011. I found myself being drawn in from the first page. The CIA component of the title added a sufficient layer of mystery to hook me. Cron is also very funny and really knows how to tell a story. At the same time, his story evoked other emotions in me as well. The book takes the reader on a journey of what it is like to grow up with an abusive, alcoholic father. Most of us know what our fathers did for a living. Ian thought he did, even though everything did not always add up: his father's frequent disappearances for weeks or months at a time, the photos he found of his dad playing golf with President Ford, the photos of his dad with Hollywood celebrities. It wasn't until he was a teenager that Ian found out that his father had worked with the CIA, on and off, for years. His career was ultimately cut short by his out of control drinking. When Ian's dad passed away, he left more questions unanswered than answered. 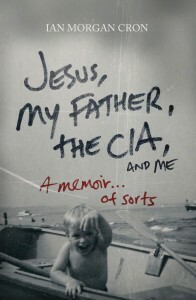 Jesus, My Father, the CIA, and Me also takes the reader on a spiritual journey with Cron. As a child, his heart was drawn to God, but the years of abuse from his father took their toll on Ian's heart. He eventually shut God out and became an alcoholic himself. Ian's journey back to God and his eventual healing is a beautiful story of restoration, hope, and God's grace. Ian's transparency and vulnerability as a writer draw the reader in and will not let them go. As he talked about his own children, I was particularly impacted. He described his own lack of an example from his father about what true fatherhood looked like. At the same time, though, he described his interactions with his children in such a beautiful way that it is clear that his Heavenly Father has come alongside him and provided Ian with all the example that he needs.